Rooftop gardens: Rooftop gardens are a specific urban agriculture niche set within a broader system of city gardens, enjoying their own set of distinctive benefits. Though the idea of roofgardens has become fairly standardized and resolved, rooftops continue to be underutilized and are rarely-considered urban spaces with great potential for creative development. There are essentially three options for rooftop gardens for rooftop gardens. Vertical gardens: Vertical gardening is a comprehensive term referring to any manner in which plants can be grown on, up, or against the wall of a building such as a vine, as part of a window shade, as a balcony garden, or in a vertical hydroponic system. 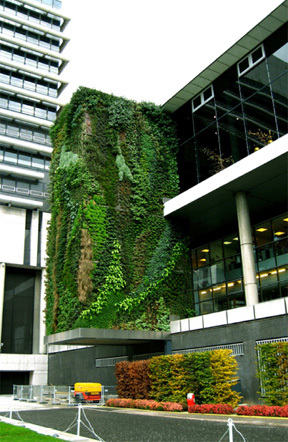 Vertical gardens act as good insulators and a source of food. They also increase the life of the structural wall behind, reduce storm water run-off, reduce the heat island effect of cities and improve the water quality. For more details see vertical gardens. Guirella gardening: Guerrilla gardening is an act of seeding useful plants in public spaces. A form of green pro-activism, primarily practiced by environmentalists, it is related to land rights, land reform, and permaculture. Activists take over ('squat') an abandoned piece of land which they do not own to grow crops or plants. Guerrilla gardeners believe in re-considering land ownership in order to reclaim land from perceived neglect or misuse and assign a new purpose to it. Some guerrilla gardeners carry out their actions at night, in relative secrecy, to sow and tend a new vegetable patch or flower garden. Others work more openly, seeking to engage with members of the local community.2) Seed-balling is an interesting technique used here. Other pro-active methods include moss-graffitti and mayday actions. Click on Guerrilla gardening for more details. Kitchen gardens and local solutions: A source of vegetables, herbs, fruits and flowers, kitchen gardens are one of the most common, easily maintained and personal manifestation of our links with ecology. As an approach, a kitchen gardener finds the shortest and simplest way between the earth, the hands and the mouth !3)In both urban and rural areas, people have been found to develop interesting indigenous planting techniques to meet their daily needs. Often in the form of regular miniature gardens, people in highly dense urban realms resort to container gardening to grow their produce. These could also appear in the form of floating gardens in Amsterdam or Kashmir. In Indian kitchens, a mixture of left over egg shells and tea leaves is used to grow garlic and onions. Garlic has other advantages like keeping snails and fleas away. Fruit and vegetable peels are often added to tea leaves to create compost while left over water, after boiling eggs is added to soil as a mineral and protein rich solvent. Often waste plastic cans and bottles play the role of containers which are used to collect left over water from washing vegetables and rice. 'Tulsi', another native Indian plant, also known as holy basil is used for its medicinal properties and worshipped in many Indian homes where it has a special place in the courtyard.4) Kitchens and kitchen gardens are inspiring places and perform the role of local solution generators which result in essential economic and social benefits. The researcher would like to thank his mother, Meena Shankar for sharing simple home solutions to inform this journey.5)6)Further details of kitchen gardens in Delhi have been discussed later in the section on Delhi under Discussion. City farms: In New york, numerous vacant plots have been converted into city farms where communities grow there own food. These range from apples to pears. Further, by using grafting techniques, fences can be made entirely out of such plants. In Melbourne, the city farms also play the role of community education centres, which is a brilliant way to introduce kids to aspects of food production. In Davis, California, through the allocation of areas for directing rain water into catchment basins, swail areas have been created which over the years have now transformed into productive fruit farms. Cooperative Arrangements: In Santa Fe, a community group is applying for a variance from the city to start using a small open space in their neigborhood for keeping chickens and bees7) and to plant an orchard. Combining their negotiating power helps with getting a variance, and distributing responsibilities as well as financial burden of setting up a productive environment ensures its stability and long-term success. Co-Ownership of Assets: In Albuquerque, a group of people that live near each other decided to downsize and now own one truck, which is shared by several households. Grafting Fruit Trees: In limited spaces one can still get a variety of fruit, when using a technique of grafting. A desirable variety (early ripening, or developed for storage, etc) is grafted onto an existing rootstock, resulting in trees that bears several types of fruit (now, apples don’t become oranges, but there can be several different apples on the same tree!). Worm Composting: A plastic bin with holes can house a family of red wiggler worms, who will be happy to eat your kitchen waste (eliminating it from the urban waste stream), and these critters will make it into good odor-free compost.